One of the pitfalls centered around going out to lunch is that lunch turns out to be much higher in calories than my usual lunch. In order to compensate for it I skipped breakfast and planned for a much lighter dinner than usual. John and I eat lunch at Zeni’s, our favorite Ethiopian restaurant. Even though we end up with copious leftovers, we still ate a lot! 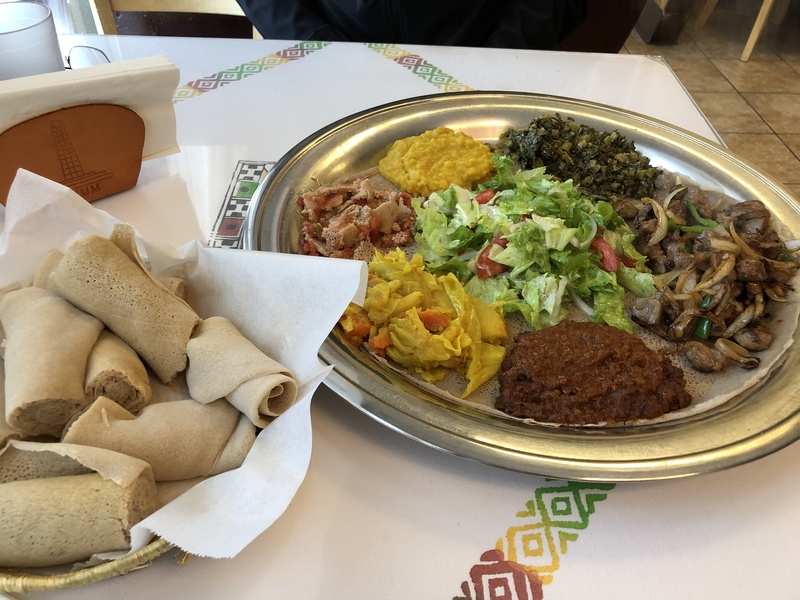 From the upper left clockwise: injera/tomato salad, split peas, greens, sizzling lamb, spicy lentils, and potato/carrot/cabbage combo. Fresh salad in center and a basket of injera to use as a utensil for scooping up delicious bits from the platter. This is soooooo delicious! For dinner John made an omelet for himself and I ate a small portion of leftover spaghetti. We are saving our leftovers from Zeni’s for future lunches. This entry was posted in Dining out, Eggs, Healthy tips, Lamb, leftovers, Legumes, Pasta, Vegetables and tagged injera, leftovers, yebeg tibs, Zeni’s. Bookmark the permalink.